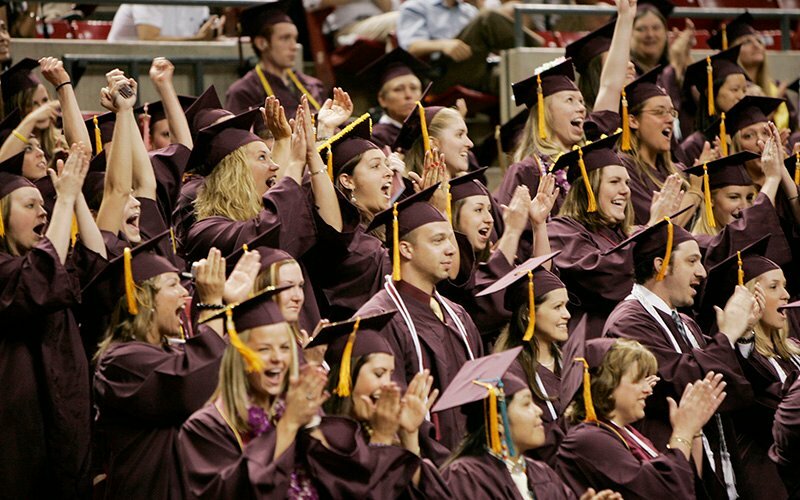 WASHINGTON – Arizona college graduates in the class of 2014 had the fifth-lowest student debt in the nation, finishing their schooling at four-year, non-profit schools with an average bill of $22,609, according to a new report. The report released Tuesday by the Institute for College Access and Success also said Arizona had a relatively low percentage of students graduating in debt: The 57 percent of state graduates carrying debt was tied for 14th-lowest in the nation. The Institute for College Access and Success looked at student debt in states across the country for 2014, and compared that the levels of debt in 2004, Arizona fared well in both areas. Nationally, 69 percent of students had college debt, and the average bill was $28,950, according to the report which is part of the institute’s Project on Student Debt. The report, and experts who looked at it, said the numbers should be looked at with caution, since responses are voluntary and the results do not include numbers from for-profit institutions. But there are several reasons why Arizona performs well, experts said. “Arizona has pretty consistently been a low-debt state,” said Debbie Cochrane, research director at the institute that produced the report. Cochrane said another reason for Arizona’s good showing in the report could be the large percentage of graduates in the report who attended the state’s public schools. Those colleges traditionally are less financially burdensome than private schools. “Private colleges tend to have more debt,” said Mark Kantrowitz, a student loan expert. The report also said that average debt among graduates from Arizona institutions had grown just 25 percent from 2004 to 2014, the fourth-lowest increase in the nation during that period. That was on pace with the inflation rate over the decade, and well below the national average increase in graduate debt of 56 percent. Several states reported increases at double or triple the level of inflation. Kantrowitz said the fact that only about half of all institutions in the country responded to the report leads to “noise” in the analysis. But the Arizona schools responding represented 93 percent of the graduating class of 2014, according to the report. The sharp national increase in average student debt over the last decade is due in part to less government funding for public colleges, according to the study. “Students have gone from kind of covering one quarter of the cost of their education to about half,” said Andy Carlson, senior policy analyst at the State Higher Education Executive Officers Association. Kantrowitz said the burden has been shifted “from the government … to the families” at a time when average family income has declined, forcing students to choose between taking on more debt and enrolling in lower cost colleges. The report said the effects of decreased government spending would be much worse were it not for an increase in grants over the last 10 years – an area where Cochrane said Arizona excels. “Arizona college students receive quite substantial grant aid,” Cochrane said, adding that public school students tend to get more than others. The relatively low increase in Arizona student debt over the last 10 years also “might signal that the grants are effectively being targeted” to the right students in the state, she said. Klein said that is exactly the case. “We do a lot of work with institutional financial aid to make sure we keep tuition affordable particularly for our neediest students,” she said Tuesday. Ultimately, grant aid nationally has not been enough to offset the rising costs. “Overall, the costs students and families have to cover – after subtracting any grants they received – have grown faster than their ability to pay, particularly for lower-income states,” the report said. Cochrane said there needs to be an increase in grant aid, so students don’t need to borrow so much. But in order to find “targeted solutions” to the issue of student debt, better data will be needed, she said. The current data was cited as one of many “significant limitations” in the report. “It’s only when we have the data that we can figure out where the problems lie,” Cochrane said.